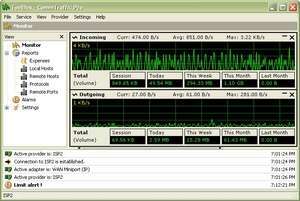 CommTraffic is a network utility for collecting, processing, and displaying traffic and network utilization statistics for both LAN and dial-up PC network connections. When monitoring a LAN segment, CommTraffic shows traffic and network utilization statistics for each computer in the segment. CommTraffic has a highly customizable, intuitive interface that displays statistics in graphical and numeric form. For security reasons, you should also check out the CommTraffic download at LO4D.com which includes virus and malware tests. Additional screenshots of this application download may be available, too. CommTraffic download been highly rated by our users.